You are selling your property in Costa Rica. You have been at it for quite a while and you finally found a buyer. You had your property listed with over 60 real estate agents. One of them finally found a buyer who brought a decent offer to the table. Land listings are sometimes hard to sell. It’s usually not so simple because you have to find out about the zoning and there are many other details involved. Is there water on the property? Are there any easements? Are there any legal restrictions? Not only land listings can cause problems before or during the real estate closing. Even homes and condos can cause an amazing amount of trouble that you might not realize until it is too late. You should always do your homework before listing your property for sale or buying a property. Here are some of the ways a real estate closing can drive you crazy. 1. There is a pending judicial lien on the property and the buyer’s attorney will not allow his client to purchase. A title has to be absolutely clear to be able to sell. A good listing agent checks the title before listing a property. A good buyer’s agent checks the title before making an offer. A good attorney checks title before signature of the option to purchase/sale agreement, before accepting money in escrow and on the day of the real estate closing. 2. There is a difference between the size of the property recorded by the survey and by the National Registry. The property is in a condominium and any change will have to be approved by all other condominium owners. Several other condominiums will have to be adjusted too and none of the owners agrees to make the correction. 3. The seller didn’t keep the passport he used when he bought. Now the closing attorney doesn’t want to accept a new passport number unless it is registered in the National Registry. For a better understanding, Costa Ricans keep the same cédula number their whole life, and their passport number doesn’t change. So a passport number change is unacceptable for most closing attorneys. 4. The outstanding mortgage cannot be paid off because the seller took over a mortgage without notifying the lender. The lender will only deliver the mortgage cancellation documents to the mortgage holder who disappeared. 5. A primary power line is registered on the property title, but does not exist. Construction permits of a house will not be extended by the city until the power line easement is cancelled. A real estate closing cannot happen before the easement is cleared from the title. 6. The buyer didn’t request a surveyor’s revision of the boundaries of the property until the last moment. He found out that the neighbor had built partially on the property for sale. 7. At the last walkthrough on the day of the closing the buyer finds out that the appliances, mirrors and curtains that were supposed to stay on the property are not there. The seller took them. The buyer will not close unless the missing items are replaced. 8. The easement that gives access to the property was not duly registered and does not legally exist. The only person who can sign off on the easement cannot be found. There was no other legal access to the property. 9. The zoning restrictions were not explained to the buyer, who doesn’t find out until closing that the property is no good for his plans. 10. There is no water in the area and the municipality will not extend building plans on the land. 11. The earnest money, upon signature of the option to purchase/sale agreement, was paid directly to the seller, instead of going into escrow. Before closing, the seller passed away. The seller did not leave a will. The sale did not happen and the earnest money was never recovered because the family used it to pay for the funeral. 12. On closing, it becomes clear that there are condominium bylaws that will not allow the buyer to extend on the home or paint it the color the way the buyer wanted it. 13. The seller never filed for the luxury home tax, or Impuesto Solidario para el Fortalecimiento de Programas de Vivienda. The closing attorney thinks the seller should have and the seller’s own attorney doesn’t agree. The seller doesn’t want to pay a professional appraiser either. Without the luxury home tax filing, there is no real estate closing. 14. The buyer and the seller decided to ask the attorney to register a lower sales price to keep transfer taxes low. Now, the seller has a settlement check for a higher value than the deed shows. The bank will not accept the seller’s deposit for a different amount. 15. The seller has not declared the property value in the municipality in the last five years. There cannot be any real estate closing until the property tax is paid up to date, a certification of up-to-date payment extended by the municipality and a property value declaration presented. 16. The seller has the property ownership in a corporation, so the closing attorney writes the settlement check in the name of the corporation. The seller has no bank account in the name of the corporation and the bank doesn’t allow endorsement of the check. 17. The home inspection acceptance was not described properly in the option to purchase/sale agreement and now the buyer wants to walk due to minor problems. The earnest money in escrow can only be recovered by going to court. 18. The sellers didn’t understand they were fully responsible for the maintenance of the property until closing. A week before a closing, the house was severely damaged in an earthquake. The seller, thinking that the property was sold, stopped paying the home insurance. There was no real estate closing. 19. The closing funds have not arrived in time for closing because the buyer’s bank froze the funds in his account. Money laundering laws allow the bank to freeze large amounts of money until proof of origin of the funds is delivered by buyer. Unfortunately, the seller does not allow for an extension of the purchase/sale agreement and will walk away with the earnest money. 20. The closing attorney did not realize at signature of the promise to sell that the buyer needed a corporation to hold the title of the property. Due to a divorce, the buyer could not hold it in his own name. There was not enough time to constitute a new corporation. Because of corporation taxes, real estate attorney do not keep shelf companies anymore. In this case, the seller agreed on extending the option for a later closing date. 21. Seven brothers and sisters have to sign the deed. At closing the husband of one of the sisters thinks they are selling too cheap. They never signed an option to purchase/sale agreement and no earnest money was held in escrow. The sale was verbally agreed on. The missing signature cancels the closing. 22. The common pool advertised as part of the condominium turned out to be on a private lot, owned by the developer. The HOA was charging for the monthly maintenance but the pool was not even registered as a common area. Selling or buying a property is not something you tend to do very often unless you are a real estate investor, a real estate agent or a real estate attorney. 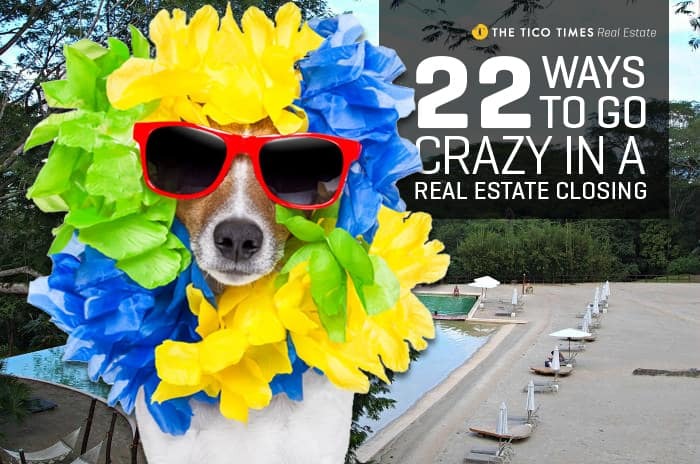 There is a solution for each one of the 22 ways a real estate closing can drive you crazy. A seasoned real estate broker and an experienced closing attorney will know how to avoid these kinds of problems.